When we have thankful hearts, and minds that are alert (watchful) to the enemy’s schemes, we will be better able to maintain the faithful practice of prayer. “Be joyful in hope, patient in affliction, faithful in prayer” (Romans 12:12). Your family can determine to obey this command by setting aside time each day to pray individually and together. The Father will reward your faithfulness. If this time is difficult to find, sit down together and plan what activities are taking away opportunities to spend time in prayer together. It may only take a few minor adjustments to find a segment of time to pray together daily. Perhaps all it will take is to turn off the television or give up excess time at the computer, etc. Talk about what being devoted means. 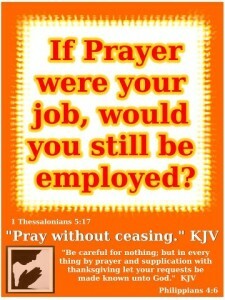 Ask yourselves if you are more devoted to other activities than to prayer. Determine to change your priorities if this is the case. 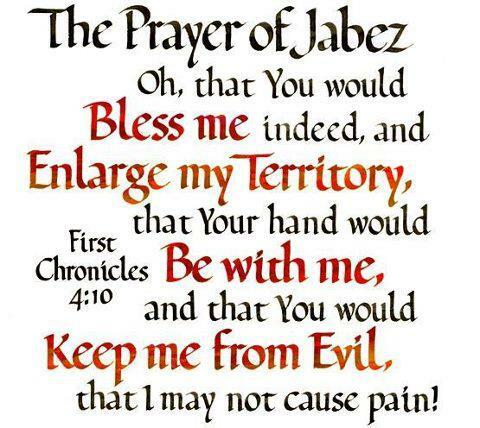 Awesome Lord, my busy life often gets in the way of faithfulness in my prayer life. Help me to see prayer as a natural part of every aspect of my everyday life so that intercession becomes like breathing to me. 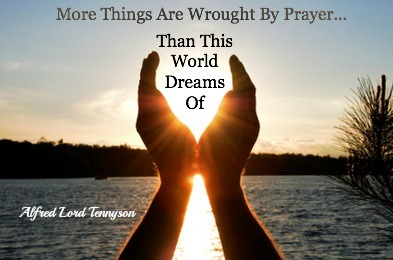 Give our family a deep desire to devote ourselves to prayer. Praise God for his faithfulness in calling you into fellowship with his Son, Jesus Christ (1 Cor. 1:9). Thank God for the privilege of being his adopted child. Confess those times when you’ve foolishly acted like an orphan rather than as one of God’s own children. Commit yourself to strengthening the fellowship you enjoy with Christ and with other Christians. Ask God to reveal to you anything that might hinder your fellowship with Christ. Pray for a close and loving bond to grow between the members of your immediate family. Ask that this bond will be rooted only in Christ Jesus. Allow your children to see and hear you praying in the morning and at night. Teach them to say a prayer in the morning before they attend school. Pray with them in the morning before they attend go. Set a time to pray with them in family prayer at least 3 times a week for at least 10 minutes and then work to more days and time if you are just beginning to start faithful family prayer. Linda Fegins. The purpose of this book is to teach you how to transform your life. While this book is no substitute for the Word of God (The Bible), let this be a guide that simply helps you gain a deeper understanding of what God is trying to impart in all of us. This book will teach you how to move beyond accepting change to embracing transformation. So, if you are seeking restoration, grab your Bible, this book, and open your heart and watch the transformation begin. Monifa Robinson Groover, a native of New York City, moved to Teaneck, New Jersey with her family at the tender age of twelve. 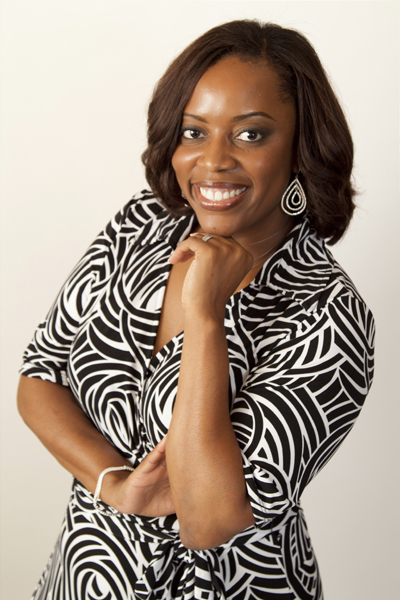 Upon graduation from Teaneck High School, Monifa obtained a Bachelor of Arts Degree in Psychology from Clark Atlanta University (Atlanta, GA), as well as a Master of Social Work Degree from Smith College School of Social Work (Northampton, MA). After relocating to Atlanta, Georgia, and extensive work in the field of social services, she obtained a Master of Public Administration Degree with a concentration in Management from Troy State University (Atlanta, GA). Monifa has devoted her life to helping others see the potential that lies within them. Having provided a number of services for diverse populations including but not limited to perpetrators of sexual crimes, individuals faced with substance abuse challenges and individuals in the criminal justice system; as well as having coached women entrepreneurs, her experience has taught her that neither position nor status dictate the level of pain and misfortune one may encounter. It was at this time she realized the call on her life was much greater. In 2003 she released her first book entitled “Within Your Reach, Inspiration That Quiets the Mind and Soothes the Soul”. (ISBN: 1-930231-03-2). This book is filled with devotions that shows people how to strategically turn their pain into gain, tragedy into triumph and victimization into victorious living. She released her second book entitled “Change Beyond The Pain” in 2012 (ISBN: 978-0-9836776-0-4). This book provides a more in-depth look at how individuals can use the Word of God to transform their lives. It also shows them how to begin moving beyond the blows that life may sometimes deal. Monifa has been called by God to help others reach their God-given potential. Her duty is to equip others with the proper tools and resources to move beyond their circumstances and live healthier and more productive lives, which she believes can only be found when one has a relationship with Jesus Christ. Her personal journey, combined with her education and work experience, and most importantly her relationship with Jesus Christ, collectively play a vital role in the work she passionately does today. She resides in Savannah, Georgia and is a faithful member of New Covenant Holiness Church #3, located in Savannah, Georgia, where her beloved husband, Jamie Groover is pastor. The Word of God tells us to be transformed by the renewing of your mind. Monifa Robinson Groover has written a very compelling guide book that teaches you how to go through the process to transform your life by facing hard questions and taking action steps to reach newness, healing and restoration in your life that lasts based on the Word of God. 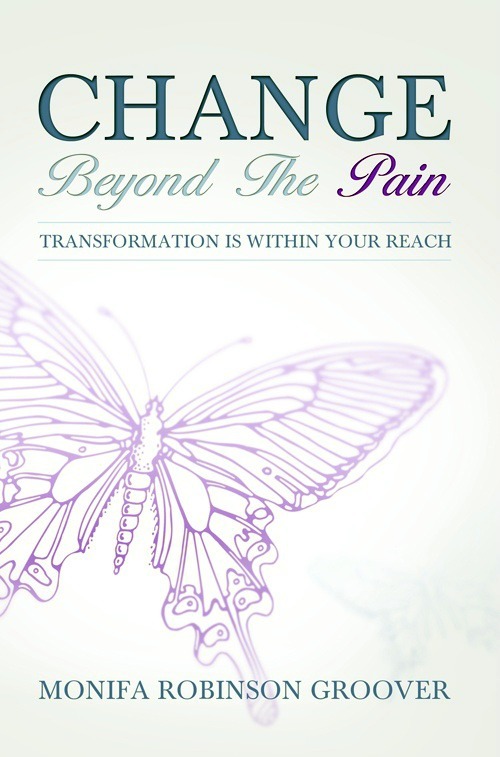 “Change Beyond the Pain” challenges you to honestly examine your life by answering question raised in this guide book strategically placed in the book. While some of the questions may seem a bit much and the word definitions like a lecture, her style of writing is like she is right there coaching you to let you know that this is for your benefit so that you can live the abundant life God has for you (John 10:10), so you please Him and will be delivered from past hurts and mediocre living. Coaches push you to your highest good and potential and this book challenges and moves you to press forward through the pain and past. Change in life is inevitable but we just don’t want to react to change, Monifa stresses that “transformation is a choice” which will allow you to be victorious over the changes that occur in your life. I enjoyed the workbook style of each chapter and the sharing of real life experiences. 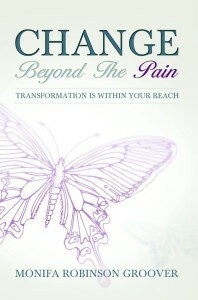 “Change Beyond the Pain” is a great tool to help you begin the journey of transformation. I loved Monifa’s statement that Faith = Movement and the chapter on the faith you must have to complete this transformation journey. Faith… But First You MUST BelieveIn order to please God, we MUST have faith. In order to surrender to God’s will, we MUST have faith. In order to embrace God’s perfect plan for our lives, we MUST have faith. In order to under¬stand God’s perfect timing, we MUST have faith. Faith is at the core. It is at the very center. This concept cannot be ignored; neither can it be pushed to the side and dealt with at a later time. Some may ask, if this concept is so important why are we just now talk¬ing about this in Chapter 7. My answer to that is very simple. When was the last time you saw a child born who started out eating meat? Never. Well, the same holds true when it comes to talking about transformation. It was important that we started out providing you with milk and soft food. And while what you have read throughout this guide thus far may have seemed somewhat difficult to digest, it was very basic. So make no mistake about it. This chapter on faith was strategi¬cally placed. Here is where we offer you some meat. We have talked about transformation on so many levels throughout this guide, yet it is only now that we are begin¬ning to see what is at the core of all of this. What MUST we really do if we want transformation to take place? What is at the heart of all this? Surrendering to God and His per¬fect plan and will for our lives, is a major step, however, we cannot surrender to God if we don’t believe He even exists. Let us to continue to lift up in pray the city of Boston and those suffering and injured in Texas. Please join us in lifting up in prayer all directly impacted by this tragedy. The families directly affected with sudden loss of life and injury physically and emotionally. Medical and counseling teams treating and serving the injured and their families. First responders to be protected and guided in their service to this urgent tragedy. Pray for resources and funds for medical costs for the injured. Protection and wisdom for all investigative personnel from Homeland Security, law enforcement agencies and fire departments. Ongoing efforts to keep our streets, cities, and borders safe for this nation’s citizens both now and in the future. Pray for our nation for peace, wisdom and protection and that we will corproately pray. Lord our God, we come as a people concerned for our fellow American citizens in the city of Boston, Texas and elsewhere specifically. God, help them to seek Your help now and going forward day by day. Draw this city, this nation to You. From Psalms 62: 8 Lord, “Let us trust in You at all times, O people; pour out your heart before Him; God is a refuge . The book is a 40 day devotional. It’s a great book for men and women. This book is designed to help those who are struggling with a consistent prayer life. It’s easy to read and very fruitful. I adored this devotional. Simple, yet elegant words, but not preachy, encompassed in power packed devotions ,which will bring much peace and strength to your life. I just didn’t read it for a review , I carried it around as a personal devotion. Over the years, I have come to understand the significance of the number 40. Scientifically speaking, 40 weeks is the length of time it takes for a mother to carry an unborn child from conception to delivery. Biblically speaking, 40 is the number associated with a period of testing before a breakthrough. The number 40 is an indication that God is ready to birth something new out of pain or challenge. According to the Bible, Noah was in the rain for 40 days and nights before God brought a refreshing promise for His people. When the Children of Israel were ready to cross over into their promise, the spies who preceded them took 40 days to scout out the land. However, because of disobedience, their 40 days turned into 40 years before they entered into the land of promise. Goliath, who was killed by David, challenged the Children of Israel for 40 days prior to their victory over the Philistine army. Before He began His ministry, Jesus, while being tempted by satan, fasted for 40 days and 40 nights in the wilderness. I have experienced my own personal 40 days of trials and tribulations. However, because I did not lose my confidence in God, I was able to realize the significance of the number 40 and receive God’s blessings for me after my test. These truths concerning the number 40 inspired me to write this devotional. In modern times, 30 days is used to complete various programs or to create a new habit. At the beginning of the year, Magazine cover stories often read, Thirty Days to a New You. For the purpose of this devotional the true number for the manifestation of a renewed life is the number 40. Therefore, this devotional will afford you an opportunity to develop a more intimate relationship with the Lord and transform your life. As you read this devotional, it will give you hope and renew your strength. 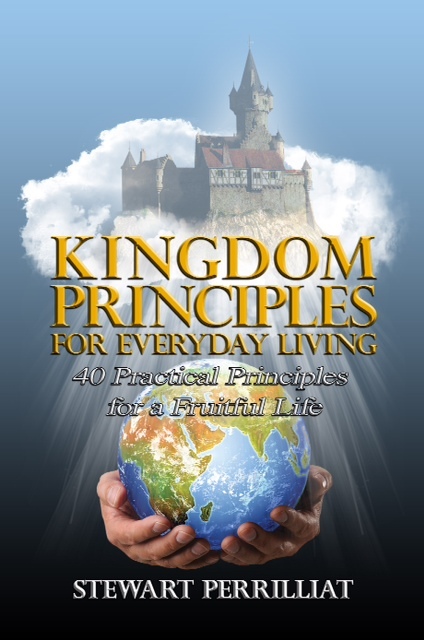 On those days when doubt and disbelief abound, I encourage you to remain consistent with your 40 day cycle of reading Kingdom Principles for Everyday Living: 40 Practical Principals for a Fruitful Life. I challenge you to apply yourself and expect a breakthrough by the time you have complete this devotional. I encourage you to not only read through the devotions in this book, but to read the related scriptures and commit them to memory. This process will increase your knowledge of God, and strengthen your faith towards Him. God’s will for us is to increase in every area of our lives by being doers of His Word. I pray that this devotional draw you closer to God and give you the incredible power to break into your promise. Minister. Father. Servant. Evangelist. Author. Stewart Bernard Perrilliat is a gifted individual who has a passion to see broken lives restored and renewed through a relationship with Jesus Christ. A native of Oakland, California, Stewart grew up in a community that was plagued with a number of challenging institutional socio-economic ills. 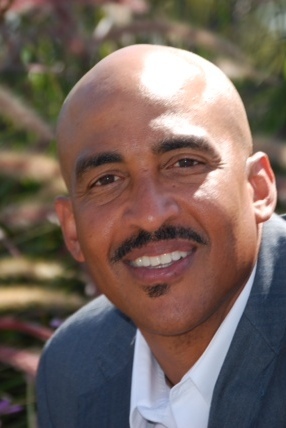 Nevertheless, Stewart escaped the lures of the streets and became a Sergeant in the United States Marine Corp before becoming the Founder and CEO of Perrilliat Enterprises, a general contracting and engineering firm based in Northern California. Stewart began his ministry call as a Street Evangelist in 1995, and since that time he has been used by the Lord to win countless souls into the Kingdom of God. He attributes his success as a Street Evangelist to his ability to present the gospel in a manner that meets people at the place of their need. His call has become the central focus of his life and ministry. Though Stewart is a gifted entrepreneur, he is first and foremost a service-driven person who is passionate about seeing people live their life now through having a relationship with Jesus Christ. Stewart’s teaching gift empowers people to apply Biblical principles to improve and enhance their lives. His approach is known for being encouraging, practical, and inspirational. He is also known for motivating others to reach their highest potential. 4. Live a Life of Integrity. 5. Focus, Be Disciplined and Prioritize-Is this step a part of your vision? Is it a priority to accomplish your goal? 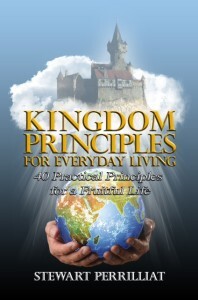 7.Understand your Kingdom Purpose. If you don’t know it seek and ask the Lord to clarify it for you. We each gave three prayer areas we wanted to pray about our businesses. 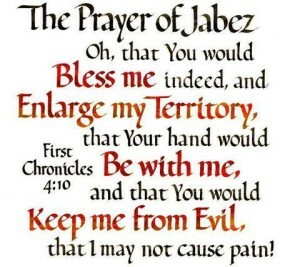 During the study and prayer gathering we were challenged to pray and make declarations about our businesses, specifically to use the Prayer of Jabez, (1 Chronicles 4:10) for the next 30 days. I challenge you to make a declaration over your life and business. Find other appropriate scriptures to declare over your business. Write down three desires you have for your business or life and join with a prayer partner to pray over them with you. 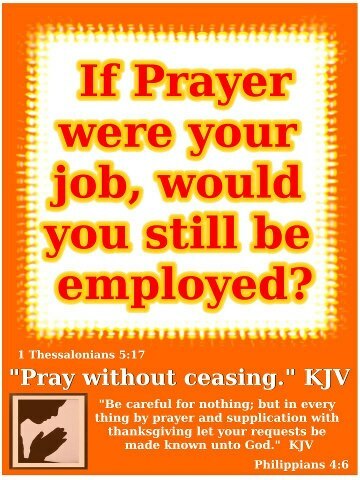 In Job it states ” You shall decree a thing and it shall be established…” Job 22:28.